SSgt Jeffrey Stiles flies the 12th Man flag in Afghanistan. As I sit and watch the World Series, I’m reminded that it’s no wonder why ticket prices are so low for the Seahawks game against the Rams on Monday Night Football. If the Cardinals and Rams are playing on the same night in St. Louis, it would be an easy decision on which game to watch. What that means for Seattle fans in the area, is that advantage should be taken to purchase these tickets (some as low as $5 each) and go to the game to drown out the Rams fans who are left. They’ll probably just be sitting there watching the baseball game on their phone anyway. If you didn’t see the big news, the Rams reportedly called Brett Favre to come out of retirement to take over for Sam Bradford who is out with a season ending injury. I’m a little bit disappointed actually, because how fun would have it been to see the old gunslinger out there in Rams gear trying to get away from the Hawks’ pass rush? It’s going to be a rough day for Kellan Clemans I think. After hearing Russell Wilson talk about the matchup, I’m glad the team is giving Clemans some respect, because the guy is good enough to play in the NFL. With that said, the Seahawks defense shouldn’t have a problem shutting down the St. Louis offense no matter who is behind center. On offense, it looks like Percy Harvin may be coming back soon, but according to Coach Carroll this won’t be the game that he’ll make his debut. It’s going to be fun to see how he fits into the offense when he does come back. Our Seahawks are 6-1 for the first time in franchise history! The way the schedule sets up, I’m going to be watching for Seattle to dominate some of these lower tier teams. As good as things were on the road in Arizona, they could have been even better. If you haven’t checked out the Sea Hawkers Podcast yet, this would be a great week to do it. We take a look at the great moments in 12th Man history and talk to former Seahawks defenseive end Joe Tafoya. He made it clear in his interview with me that he was not impressed about how the Chiefs came up with the noise record. Hopefully we find out soon if we get another chance at the record. Finally, welcome to our newest members of the club. We’ve had about 30 new members join in the past week. Hopefully you enjoy the weekly information, the recaps, and the online community we’ve worked to assemble. The World Series is messing up the football schedule for our Sailors a little bit, but not to worry, DTS will show the game eventually. For those watching aboard ship, you look for the game live on DTS Sports at 1730 PT/0030 GMT. If the World Series is on, then the game will air via delay at 0400 PT/1100 GMT on Tuesday. For those watching on AFN, the game will air live on AFN Xtra at 1730 PT/0030 GMT/0500 AFG. While you’re watching the game, remember to jump on over to AFN’s website to vote for the Fan’s Choice Game of the Week. Otherwise I’m not sure if Seahawks vs. Buccaneers is going a game that will make it to air. 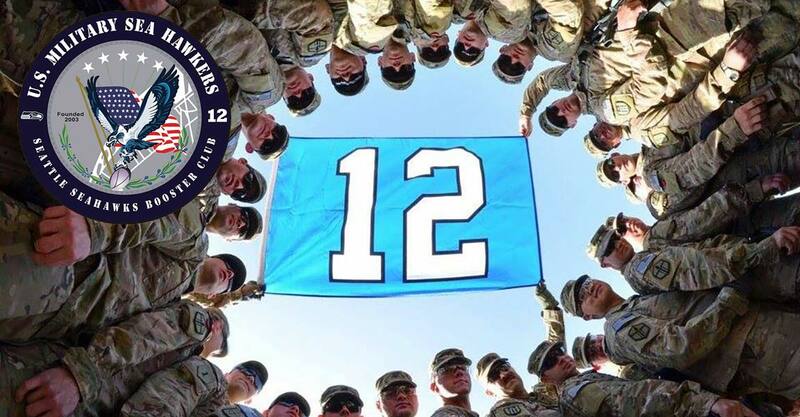 Please continue to vote daily for the Seahawks in the USAA Million Fan Salute. We are right up there toward the top and we want to stay there! If Seattle can finish in first after voting concludes, Joint Base Lewis McChord will receive a major facility upgrade provided by USAA. Text “follow voteseahawks” to 40404 to get daily reminders. Click on the graphic to vote, or visit millionfansalute.com. Episode TWELVE is dedicated to the 12th Man. Not only do we get to discuss one of the Seahawks most impressive victories this season against the Cardinals, we bring on a former member of the Seattle Seahawks. Adam and Brandan also talk about the upcoming road game against the Rams. Adam says that a “land hurricane” can’t even save the Rams from a loss this week. Joe Tafoya, a 7-year veteran of the NFL and defensive end for the Seahawks from 2005-2006, joins the Sea Hawkers Podcast to talk about Volume 12. As co-owner of Volume 12, he led the effort behind the record breaking attempt for the loudest crowd roar against the San Francisco 49ers. One thing is clear, Tafoya is not impressed with the way the Kansas City Chiefs broke the Seahawks noise record. Instead of having the crowd roar be an organic part of the game, he says that Chiefs fans were directed to assemble what fans were remaining in the stadium and let out one big cheer in one final attempt to break Seattle’s mark. In the final segment of the show, Brandan lists some of the top moments in the history of the 12th Man. The show is capped by the Seahawks fans at the Arizona game earning well-deserved recognition for being Better at life than Skip Bayless and also louder than the Cardinals own home crowd.